In 2001 at age 55, Betty Garee found herself without a job. With the economy taking a nosedive, she did what she saw as her only option — she decided to go into business for herself. With help from her daughter, Angela Burns, and one other person, she started her own magazine. 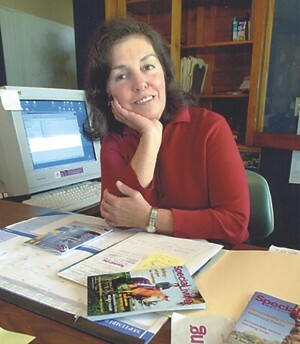 As the founder and editor of SpeciaLiving, a national magazine for mobility-impaired individuals, Betty established her publishing niche. She had been editor of a similar publication for 25 years. "After 25 years I was very interested and involved in the problems disabled people face and how they overcome those problems,” Betty says. The 5-by-7-inch magazine is published four times a year. Each issue has more than 80 pages of stories of interest to people with disabilities. The annual subscription cost is $12. Articles deal with topics as diverse as a charming and accessible Southern home, negotiating the cobblestone streets of Pompeii, healthy living in a wheelchair or descriptions of specialized products. SpeciaLiving covers a topic that is becoming increasingly important in American society. "If someone becomes disabled,” says Betty, “there is information out there that he or she needs.” She explains that with the Americans with Disabilities Act affecting everything from parking spaces to employment, more and more people with disabilities are able to join the rest of society in the workplace and in social situations. “They need to know how to do that, given their physical limitations,” Betty says. For more information about SpeciaLiving, call (309) 820-9277 or visit www.specialiving.com. Clive Soden is a writer and Web developer. His Web site is at: www.clivesoden.com.